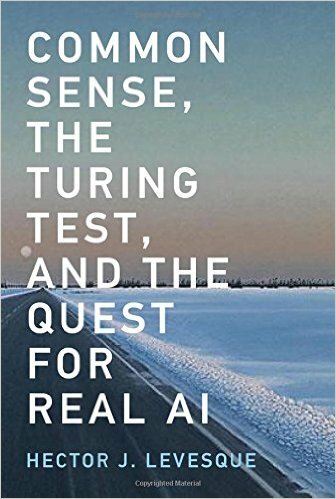 It was fascinating to read this book immediately after Ed Finn's What Algorithms Want. 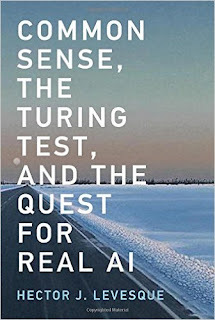 They are both by academics on aspects of artificial intelligence (AI) - but where reading Finn's book is like wading through intellectual treacle, this is a delight. It is short, to the point, beautifully clear and provides just as much in the way of insights without any of the mental anguish. The topic here is the nature of artificial intelligence, why the current dominant approach of adaptive machine learning can never deliver true AI and what the potential consequences are of thinking that learning from big data is sufficient to truly act in a smart fashion. As Hector Levesque points out, machine learning is great at handling everyday non-exceptional circumstances - but falls down horribly when having to deal with the 'long tail', where there won't be much past data to learn from. For example (my examples, not his), a self-driving car might cope wonderfully with typical traffic and roads, but get into a serious mess if a deer tries to cross the motorway in front of it, or should the car encounter Swindon's Magic Roundabout. There is so much here to love. Although the book is compact (and rather expensive for its size), each chapter delivers excellent considerations. Apart from the different kinds of AI (I love that knowledge-based AI has the acronym of GOFAI for 'good old-fashioned AI'), this takes us into considerations of how the brain works, the difference between real and fake intelligence, learning and experience, symbols and symbol processing and far more. Just to give one small example of something that intrigued me, Levesque gives the example of a very simple computer program that generates quite a complex outcome. He then envisages taking the kind of approaches we use to try to understand human intelligence - both psychological and physiological - showing how doing the same thing with this far simpler computer equivalent would fail to uncover what was happening behind the outputs. For too long, those of us who take an interest in AI have been told that the 'old-fashioned' knowledge-based approach was a dead end, while the modern adaptive machine learning approach, which is the way that, for instance, programs like Siri and Alexa appear to understand English, is the way forward. But as the self-driving car example showed above, anything providing true AI has to be reliable and predictable to be able to cope with odd and relatively unlikely circumstances - because while any individual unlikely occurrence will probably never happen, the chances are that something unlikely will come along. And when it does, it takes knowledge to select the most appropriate action.